Philippa teaches a wide range of classes from Precision Piecing to Finishing Techniques. If you see it in her work she probably teaches it! Classes range from half a day in length to a full five days. Below is an outline of Philippa’s most popular classes. Please email her directly for more information on longer workshops, for class supply lists and current workshop prices. Thank you. A welcome 3 course meal on the first evening at 6:30pm. The conference rooms, where the classes are held, are available for use outside of these hours (except the last day when the finish time is 5:00pm). An evening visit and meal at Philippa’s home. Accommodation for the class participants is at Highfield Farm which has nine bedrooms. The building has been refurbished to a very high standard. There is a lovely large communal lounge, dining room and alcohol license - for those who might need it! 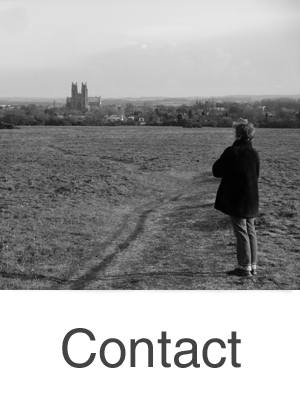 Please email Philippa for more information or to inquire about booking a place. Two day class suitable for all levels. Create a fun quilt top with an easy curved piecing central heart motif surrounded by two borders - a contemporary fused appliqué border and a further straight pieced border. The easiest curved piecing which is trimmed to size so everyone can achieve great results! One day class suitable for all levels. Create a fun heart block using two different sewing techniques which are combined to give a contemporary design and an interesting construction process. As well as learning new sewing techniques you will choose your fabrics in an intuitive and spontaneous way to achieve a dramatic and balanced central motif. Interesting and varied border treatments will be discussed to enable you to complete a small quilt or much larger bed sized project! A four hour class suitable for all levels. A practical half day workshop to help you achieve prize winning accuracy. Masses of techniques, information and advice on every stage of the piecing process. Fabric selection, using the correct rotary cutting methods, sewing accurate seams, matching points and pressing are examined in detail with extensive demonstrations. Make a perfectly sized, ‘no points lost’ block and never be frustrated again! Full-day class suitable for all levels. A practical workshop to help you achieve prize winning accuracy. Masses of techniques, information and advice on every stage of the piecing process. Fabric selection, using the correct rotary cutting methods, sewing accurate seams, matching points and pressing are examined in detail with extensive demonstrations. Make a perfectly sized, ‘no points lost’ block. 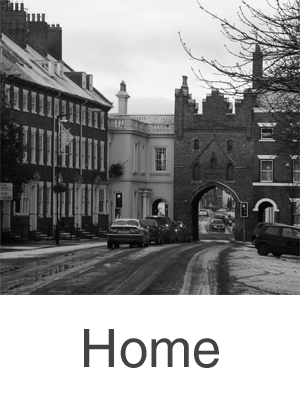 Learn about borders and how to produce really neat corners. Add double borders to your block choosing either mitred or square cut corners for a perfect finish! A practical workshop packed full of information and advice to help you achieve beautifully crafted precise work. Philippa Naylor shares her experience of over 25 years as a clothes designer and more recently top award winning quiltmaker. 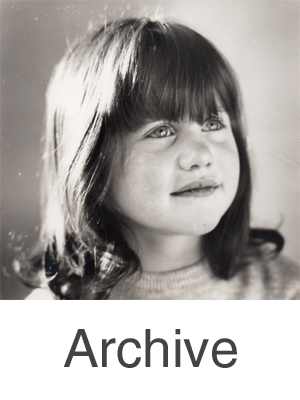 Philippa will discuss the materials and equipment she uses in her own work. She will then demonstrate a variety of techniques. The focus will be on use of colour and choosing fabrics, how to achieve the most accurate cutting, sewing and pressing - whilst having fun doing it! Full day class suitable for confident beginners and beyond. Learn Philippa’s unique award winning curved piecing method. The class begins with extensive discussion of materials, equipment and working methods, Students are given a master pattern for a small curved quilt and learn how to make templates the easy way. Detailed demonstrations illustrate how to cut curved shapes with a rotary cutter. After further demonstrations students sew their mini quilt top together using precise techniques sure to give wonderful results. 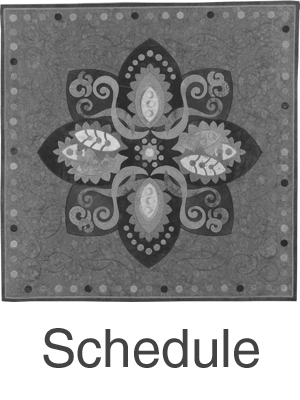 A great opportunity to learn an entirely different way of creating a beautifully crafted contemporary quilt top! Two day class suitable for confident beginners and beyond. 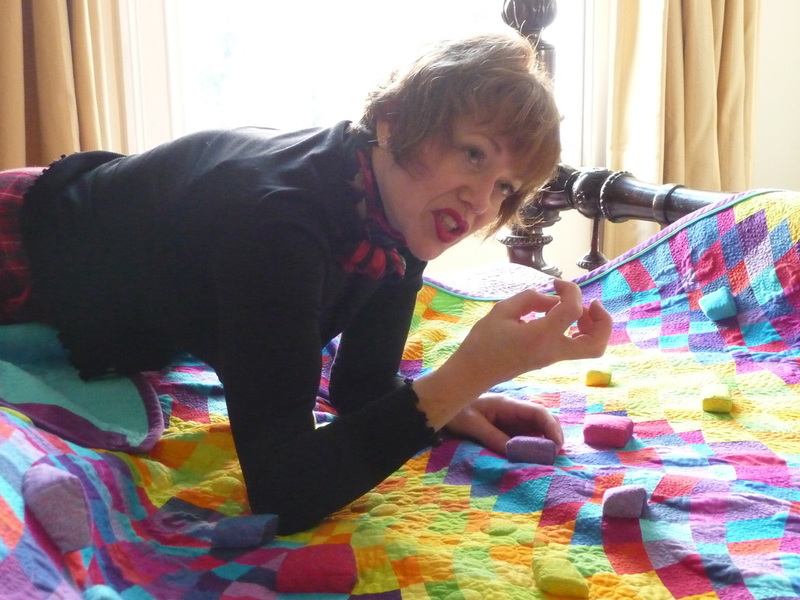 Learn Philippa’s unique award winning curved piecing method in this exciting class where students have the opportunity to make their own master pattern for a small curved quilt. The class begins with extensive discussion of materials, equipment and working methods, Students are shown how to draft a master pattern for a small individual curved quilt and learn how to make templates the easy way. Detailed demonstrations illustrate how to cut curved shapes with a rotary cutter. After further demonstrations students sew their mini quilt top together using precise techniques sure to give wonderful results. A practical workshop exploring turned edge and satin stitch appliqué techniques. A range of samples will be sewn. 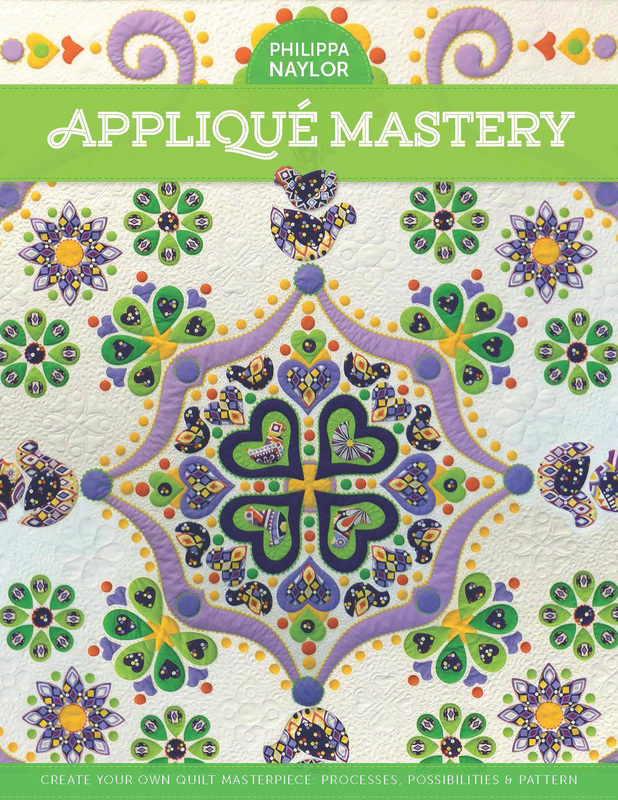 The morning will be spent discovering turned edge appliqué, with particular emphasis on convex and concave curves, hearts, perfect points, and the smoothest turned edge circles you have seen! We will look at ways of embellishing these with embroidery and purchased trims such as rick rack. In the afternoon satin stitch will be our focus, discovering the best threads to use, how to create perfect satin stitch circles and how to deal with corners and points. You will be sure to leave class with a of wealth creative ideas and new found technical skills. A practical workshop exploring blanket stitch and free-motion raw edge appliqué, and a wide range of strip appliqué. A range of sample shapes will be sewn using blanket stitch and free-motion techniques, with a particular focus on creating perfect circles, smooth curves, sharp points and directional changes in the sewing line. We will examine all kinds of strip appliqué including continuous bias strips, rouleau loops, mitred strips and the skinniest bias strips to be seen. A range of handouts and patterns will be given and can be used as a starting point for your own appliqué project - which might be a cushion or even a king sized quilt! You will be sure to leave class with a good understanding of how shape informs technique, and a wealth of creative ideas. The above two appliqué classes combined - and more too! Exploration of this wonderful technique begins with a discussion of materials, equipment and working methods. After demonstrations students practise the techniques and sew a range of samples including spirals which grow into flowers, flowers which flow into leaves and clam shells which become brick designs. They will leave the class feeling inspired, confident and keen to continue improving their skills.ative ideas. Full day class suitable for all levels. Exploration of this wonderful technique begins with an in-depth discussion of materials, equipment and working methods. After extensive demonstrations students practise the techniques and sew a range of samples including wavy ‘squares’, spirals which grow into flowers, clam shells which become brick designs and feathers which evolve into all-over sophisticated stippling. They will leave the class feeling inspired, confident and keen to continue improving their skills. Half day class suitable for all levels. 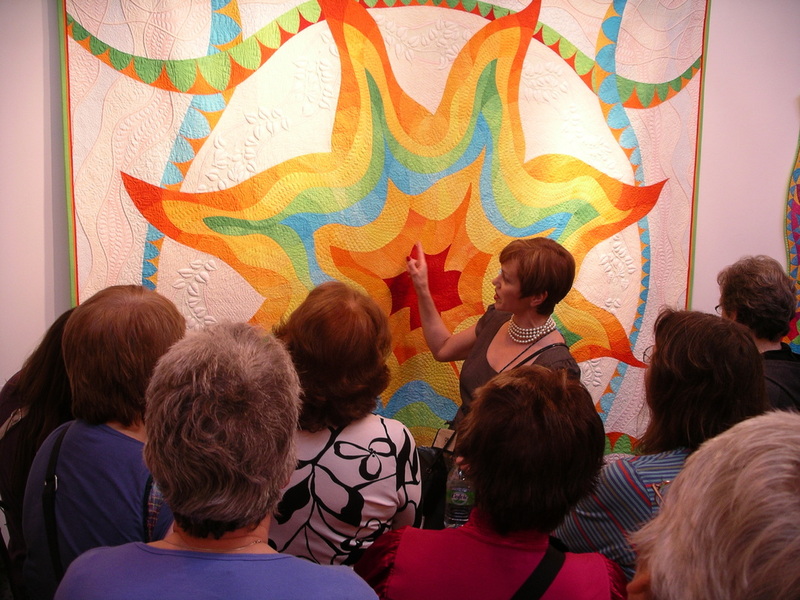 A fun workshop to excite your creativity and extend your free-motion machine quilting skills. Explore and stitch many different free-motion feathers including straight and narrow, wide and curved, all-over designs and a wreath. Try them all whilst learning which materials, equipment and sewing techniques work best. Full day suitable for all levels. Learn how easy and versatile machine trapunto can be, using regular straight stitch and/or free-motion techniques. A fabulous way of adding sculptural dimension to your work. 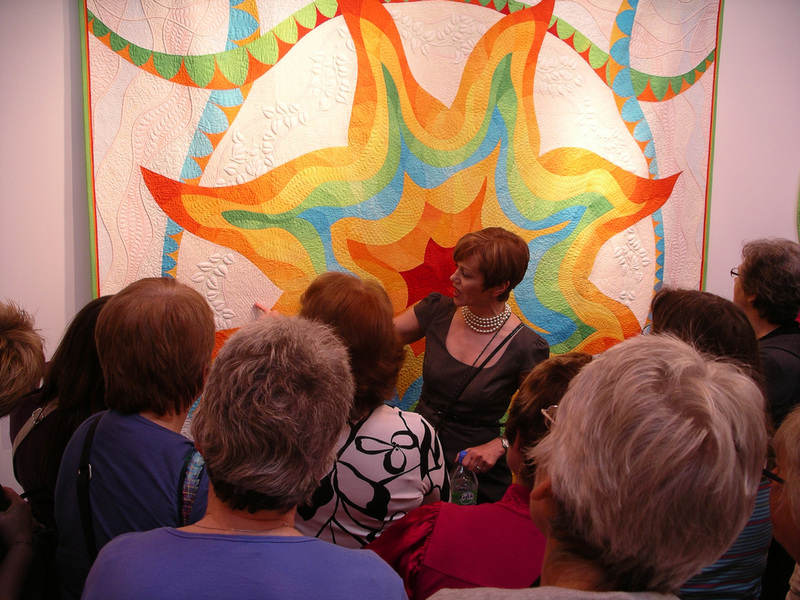 Discuss material and equipment preferences, and gain insight into original and distinctive quilting patterns. After extensive demonstrations students produce a small trapunto sample quilt using the techniques Philippa employs in her own work. Patterns are provided at a small charge. There will be a choice of different patterns to accommodate different tastes and ability levels! Learn how easy and versatile trapunto and corded yarn trapunto can be. Both fabulous ways of adding sculptural dimension to your work, giving a lovely combination of line and shape definition. Discuss material and equipment preferences, and gain insight into original and distinctive designs. After demonstrations students produce a small trapunto and corded trapunto sample quilt using the techniques Philippa employs in her own work. Patterns are provided at a small charge. There will be a choice of different patterns to accommodate different tastes and ability levels! Studies in free-motion machine quilting, trapunto, and corded trapunto. Two days suitable for confident beginner to advanced. 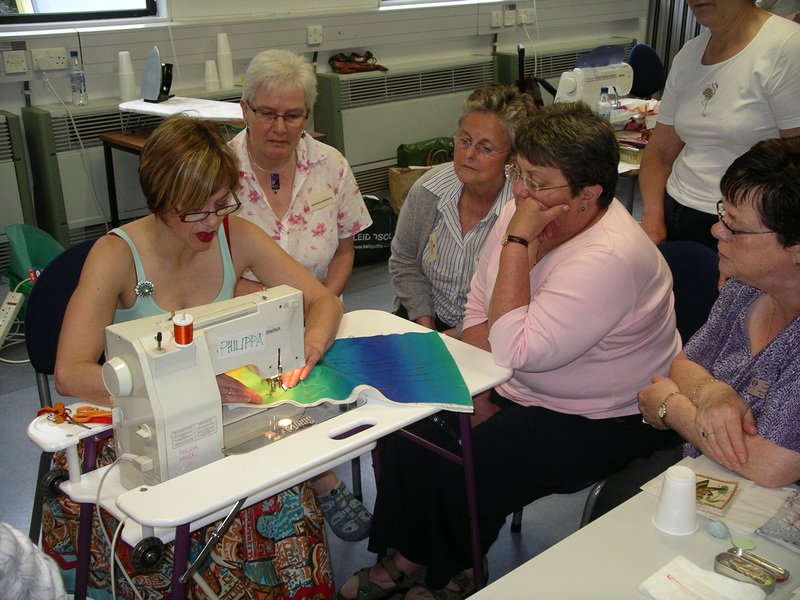 A stress free practical two day workshop exploring, in detail, a wide range of exciting free-motion machine quilting styles and techniques. At the end of the two days Philippa hopes that the students will know everything that she knows about free-motion machine quilting and all that remains is for them to go home and practise (and maybe practise a bit more!). The emphasis is on learning new skills in a relaxed but productive environment, working in a supportive group to discovering individual machine quilting personalities! 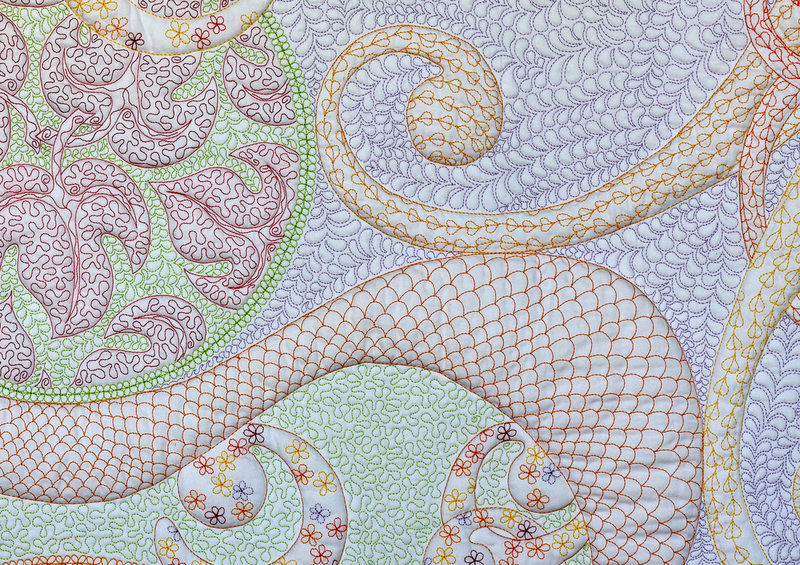 Add a final stylish flourish to your quilts. 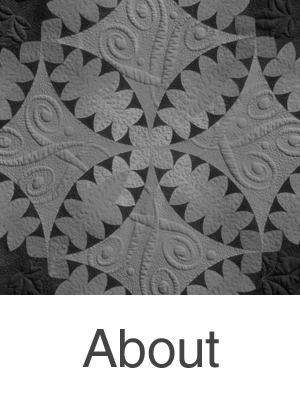 A practical class where you learn to finish the edges of your quilts using the techniques employed in award winning quilts. Contrasting fabric covered piping and double folded binding are attached by machine to give beautiful straight edges, perfect corners and invisible joins. Learn award winning techniques to get the best possible finish to the edges of your quilts. In this practical workshop a variety of samples are made. These include beautiful mitred borders, contrasting fabric covered piping, the neatest double folded binding, how to make a hanging sleeve and so much more! The Finish Line. Unusual, creative and clever ways to complete your quilts. Be inspired by a range of decorative edges to take your quilt, wall hanging or home furnishings from being good to being really special. We will make samples to discover how to create shaped and straight edge facings, how to make decorative rouleau loop trims and how to create a range of fancy prairie point details. In addition to this we will learn how to hang and support unusual shaped quilts with plastic boning reinforcements that are invisible from the front of the work. So much more interesting and inventive than the usual binding, this class will inspire you to make the most innovative design choices right up to the very last stitch! Award winning techniques to enable you to get the best possible finishes to the edges of your quilts. A variety of samples are sewn. Learn how to make and apply single and double rows of contrasting fabric covered piping. Achieve the neatest double folded binding with beautiful mitred corners and an invisible join. Make a faced edge quilt sample with the most perfectly square ‘bulk free’ corners! Full Day - All Levels. Essential skills to use in all your garment sewing - from simple everyday clothing to wearable art to creative couture. Explore and make samples of a range of pockets in different fabrics suitable for a range of garments. Unlined patch pockets for shirts, blouses and summer dresses. In-seam pocket for skirts and dresses. Welt pockets for tailored outerwear. 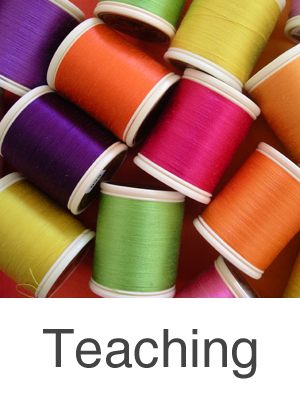 The day will be invaluable in helping you achieve success with your garment sewing. You will be inspired to develop your skills further and to continue making high quality individual garments that you will be proud to wear! Explore and make samples of a variety of seams for use with a wide range of different fabrics. Hong Kong bound seams for unlined outerwear, French seams for fine and sheer fabrics, decorative flat fell seams for statement details. Discovering how to press seams of different types and in different fabrics will be covered carefully as good pressing is as important as good sewing techniques. Learn how to insert a zipper perfectly by machine and also using a fine hand stitched method employed by couture houses. We will be using a technique that I have developed to eliminate the unsightly bulk at the top of the zipper where it meets the neck or waistline facing. The day will be invaluable in helping you achieve success with your garment sewing and you will be inspired to develop your skills further and to continue making high quality individual garments that you will be proud to wear! Explore and make samples of different styles of buttonholes for use with different fabrics. Machine made satin stitch buttonholes for use in shirts, blouses and dresses. Gimp reinforced machine sewn buttonholes for heavier outerwear garments. Bound Buttonholes for coats and jackets. Learn all about the correct size, placement and spacing for buttons and buttonholes. Discover how to sew buttons to your garments using couture methods. Learn how to reinforce buttons so they stay strong and don’t pull away damaging the garment fabric. Three To Five Days - Beginner and Intermediate Levels. A practical class for beginner quilters who want to find out how it is all done, and for intermediate students who want to bring their quilt making to award winning standards. In this workshop students complete a small pieced quilt which will be the most technically accomplished they have ever produced! We begin with discussion on the materials and equipment used for precise piecing. We look closely at the piecing process and outline areas where problems can arise and mistakes be made. Armed with this knowledge students cut and sew blocks for their mini quilt (instructions supplied). When the blocks have been completed we look at ways of joining the blocks together with sashing or other decorative pieced elements to create secondary patterning and increased visual interest. A range of border styles and ideas will also be investigated. The class continues with an introduction to machine quilting. After discussion of materials and quilting demonstrations the mini quilt is sandwiched with batting and the students begin to machine quilt. Focus on machine quilting with the feed dogs raised and free-motion machine quilting. Finally the students learn how to pipe the edge of their quilt (single or double rows of piping) for that final splash of colour before applying the binding. They learn how to make and sew double folded binding with absolutely perfect mitred corners and invisibly joined ends. Finally sew on a neat, exhibition quality hanging sleeve. Students stand back and admire their beautiful workmanship! Five Days. Suitable for confident beginner to advanced. Level: Suitable for confident beginner to advanced. Free-motion machine quilting experience is not necessary. Content: Make a unique pieced quilt with gorgeous curvy lines and beautiful free-motion machine quilting. Detailed Description: Working on the machine right from the word go, you begin by sewing a simple curved block which introduces you to Philippa's unique curved piecing method and quickly enables you to understand the principles of the technique. 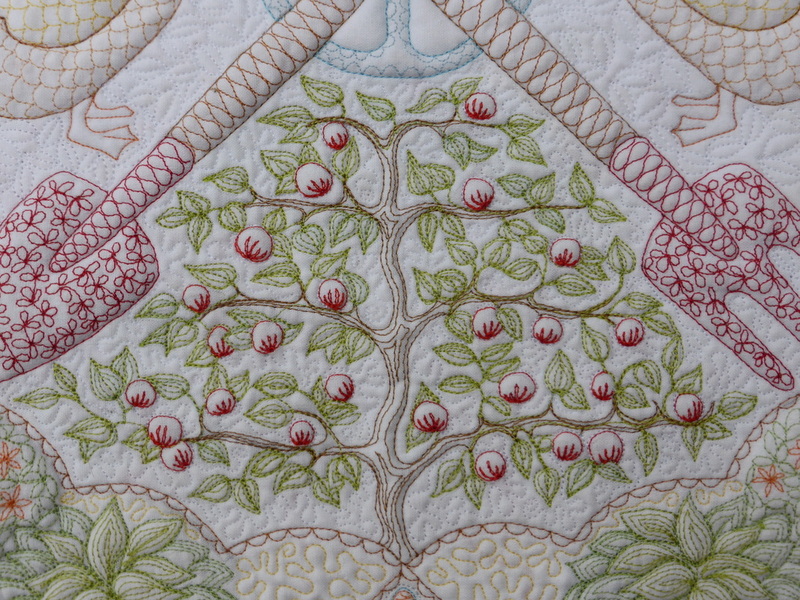 In-depth discussions on creating dramatic quilts follow, and with these principles in mind you create an individual design and learn how to draft a master pattern for a small curved quilt. From this master pattern you then make templates in a quick and easy way. You cut the quilt top using these templates and fast rotary cutting techniques. After extensive sewing and pressing demonstrations you assemble your unique quilt top using precise methods sure to give wonderful results. When the small quilt top is completed you continue by exploring a range of free-motion machine quilting styles including trapunto (stuffed quilting) which will further enhance your quilt top. You sew a number of free-motion samples to practice techniques and to begin to compile a fabric reference of ideas. Armed with these stitched quilting ideas you decide how to develop and adapt them before applying them to your pieced curved quilt. Throughout the five days Philippa shares her design skills and the technical knowledge gained during a long career working in industry as a clothing designer, and since 1996 as a quiltmaker. You are encouraged to really get your money’s worth and ask as many questions as possible so that you go home bursting with new knowledge, ideas and the desire to create. The emphasis is on learning new skills in a relaxed but productive environment, working in a supportive group to discover individual quilting personalities and styles. Five Days. Suitable for confident beginners to advanced stitchers. The focus of this class is to study in detail both composition and fine workmanship techniques. To create a dramatic quilt which will draw you in from across the room and then invite you to study beautiful stitched detail in machine appliqué. We begin with extensive exploration of machine appliqué techniques. These techniques include raw-edge, turned-edge, satin stitch and invisible machine appliqué. Learn how to sew perfect satin stitch circles, turned edge circles and embellished circles. How to make the neatest rouleau loops and make and mitre a variety of bias strips. Combining a variety of appliqué methods within a single piece of work gives the maker an exciting range of processes to create with, and results in many visual elements to explore. Students sew a number of appliqué samples to practice techniques and to begin to compile a reference library of ideas. Quilt composition studies in colour, use of fabric, tonal contrast, balance, movement and depth follow. Armed with the composition principles, and an understanding of how different appliqué techniques inform design and construction, the students decide how they will develop and adapt these themes and begin a small individual appliquéd quilt top. Throughout the five days Philippa shares her design skills and the technical knowledge gained during a long career working in industry as a clothing designer, and since 1996 as a quiltmaker. She will demonstrate many different techniques and offer as much information as she can possibly fit in to the time available. Students are encouraged to really get their money’s worth and ask as many questions as possible so that they go home bursting with new knowledge, ideas and the desire to to create. The emphasis is on learning new skills in a relaxed but productive environment, working in a supportive group to discover individual quilting-making personalities and styles. Three To Five Days - All levels. Bring quilt tops from home and take this exciting opportunity to begin quilting them in new and creative ways. Each day begins with a structured lesson, after which students work on their quilt tops using the ideas and techniques covered in class. We will look extensively at materials and equipment. Students then learn how to design an individual quilting pattern for their quilt(s). These may be contemporary with modern styling or traditional, perhaps with hand drafted feather designs. Students make a range of samples to practise a variety of techniques and to develop their own fabric design library. These samples will include free-motion work (stippling, flowers, informal feathers, leaf filler stitches to name but a few) and trapunto (stuffed quilting). Various threads are used to give inspiration as to how they might be employed in the quilt. Experimentation is the key. 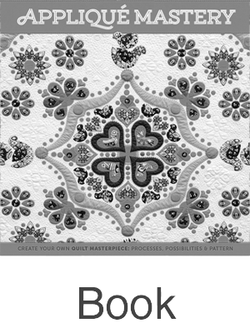 You don't have to be perfect with free-motion work to achieve wonderful effects with machine quilting. Aimed to inform and inspire students will gain confidence and creative skills, producing beautiful work in class and also in the quilts they go on to make in the future! Five Days - All Levels. An opportunity to create a quilt in which stitch and a single piece of fabric tell the entire story. This story will be as individual as each student and will range from traditional to contemporary, and from controlled precision to free spirited and experimental. Philippa’s aim is to give her students the skills they need to produce the work they want to make, in whatever style they want to make it! She shares as much technical and design led information as she can in the time available, and encourages everyone to come. Beginners and seasoned stitchers alike, all are welcome to join this exciting and creative exploration of quilting possibilities! Discussion of materials and equipment - different fabrics, threads and battings (waddings), machine feet, needles and more. Sew a range of free-motion samples (flower, leaf, feather and line) to build up a reference of ideas for the whole-cloth work and to improve technical skills. Have a basic drawing and template making lesson to find out how easily compositions can be created. Explore the possibilities of trapunto - traditional, embellished with stitch and corded trapunto. Examine pre-programmed machine embroidery stitches and see how they might be employed the work. Produce hand embroidery samples and looking at embellishing with beads and other trims. Having discovered the possibilities outlined above the students will design a small whole-cloth quilt with an interesting, balanced and proportional composition. Once the individual design has been marked onto the fabric the sewing ‘for real’ begins and the many and varied ideas come to life! I also need to update the 'Drama and Detail' Course too and am working on that tonight so willbe back with that as well. Studio students have the opportunity bring work in progress, come with a new project or even come with the desire to begin something even if they are not quite sure what it is! This applies not only to quilts but also to garments (my experience as a fully trained and time served clothing designer means I am able to assist with both technical and creative issues!). Each morning students join me and the rest of the group for a short session which will touch on different areas of creative sewing. 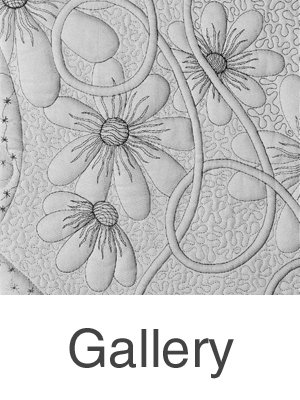 For example - the principles of design, inspiration for quilting a work, demonstration of free-motion techniques. Students are encouraged to get as much information out of the teacher as possible whether it is of a technical or design led nature! The rest of the day they will be free to work on their own projects at a rate which is comfortable for them. The teacher is always available to assist with technical and design lead questions, with the emphasis will on having the opportunity to work in a relaxed but productive environment. Students can immerse themselves totally in their work without the distractions of everyday life, and be sure that the activity around them will be both stimulating and exciting, leading to creative possibilities they had not imagined.